Once upon a time, anglers didn’t need to pay any attention to the type of saltwater fishing line they were using. It was an easy choice, mono was the only option, but then fluorocarbon made an appearance offering improved resistance to abrasion and lower visibility. n this article, we’re going to take a look at each of the line types: Monofilament, Fluorocarbon and Braided lines, discuss their pros and cons and their unique properties. So, what is the best line for surf fishing? The answer is braided lines. Braided fishing lines have very little stretch, low visibility, high strength to thickness ratio and low memory. For more details as to why we think this is the case and what makes braided lines stand out read on. 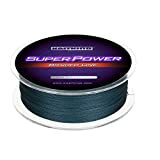 Pros: One of the biggest selling points of mono or copolymer fishing lines is that they are cheap to buy. If you’re using new line, it cast very well, it’s easy to knot with and the knots hold well. The line also has a certain amount of stretch, which in some circumstances can be beneficial. For example, the stretch will work in your favor if you’re topwater fishing, where predatory fish tend to slam your bait, in these circumstances the stretch can help set the hook. Mono is also more resistant to abrasion when compared to braid or fluorocarbon. So, if your line gets caught on an underwater snag, you’re less likely to lose the fish when using Mono. Cons: Mono is not without its pitfalls. The fishing line can be incredibly stretchy, with some types stretching up to 30% when under load. This inherent stretchiness can make it challenging to feel light bites and you may not feel them at all. Additionally, maneuvering a hooked fish away from obstructions or locations that could cause a snagging risk is difficult with a stretchy line. Perhaps the biggest drawback with monofilament is its memory. With time, mono will end up taking on the shape of the spool, this causes the line to loop and create friction as it passes through the rods guides. The increased friction will cause decreased casting distances and can increase the likelihood of tangles and knots forming. This behavior is especially apparent during colder periods. Lastly, monofilament will degrade if exposed the sunlight over time, weakening the line and increasing the chances of breakages and snapping due to shocks. Modern-day mono is almost certainly an improvement over previous decades. The latest iterations of the line are less prone to stretching and memory, they resist abrasion better than any other line and they are stronger and thinner than anything gone before. If you know how to work with monofilament and you are aware of its inherent strengths and weaknesses, it offers an inexpensive way to get great value. It’s especially well-suited to new anglers, as it’s forgiving, cheap to buy and it’s easy to use. Once you’ve developed your touch as an angler, consider moving onto Fluorocarbon or Braid. Pros: One of the biggest advantages of fluorocarbon is that it boasts a refractive index which closely resembles that of water, in practical terms this means that once it’s submerged in water it’s incredibly difficult to spot. Fluorocarbon is also extremely tough and resists abrasion very well, this means in many situations where snags and underwater structures could cause a problem, fluorocarbon offers distinct advantages. Line stretch is still present, but its much improved over monofilament, you can expect between 5 and 10 % line stretch. Additionally, fluorocarbon will not float, it’s spool memory is minimal and it isn’t broken down by Ultra Violet rays as quickly as monofilament is, meaning it’s shelf and use life is extended. Cons: Not all brands of fluorocarbon are created equally, so you may need to shop around to find a decent brand with a proven history. The line is somewhat stiffer than monofilament, which can make working with it challenging at times, knots may slip if not secured correctly. We’ve seen people use a spot of super glue to secure fluorocarbon knots securely. Additionally, as the line sinks quickly, it’s not best suited for lures that play across the surface of the water. Fluorocarbon is frequently used as leader material when surf casting, which it’s particularly well suited for. Due to its unique refractive index which closely mimics that of water, it becomes near invisibly once submerged, which is a great feature when fishing in clear waters and fussy fish. As it’s also resistant to abrasion and not as stretchy as monofilament, it’s perfectly well suited for use in leader line. Overall we wouldn’t hesitate to recommend fluorocarbon for surf fishing, it offers boasts several unique features and is a great choice for anyone looking to move away from mono. Pros: Braided lines are made from synthetic fibers wound and intertwined into a rope-like structure. This structure allows for braided lines to provide significant strength while maintaining a small diameter. Not only does this mean the lines are harder to spot in the water, but they are easier to cast and provide greater amounts of sensitivity to the angler due to very little stretch. Even if you happen to snag your lure or hook on an underwater obstacle, braided lines are so strong that it’s not uncommon for hooks to be snapped or straightened out rather than the line breaking. They are excellent for fishing in areas with heavy cover or weeds, offering the opportunity for fisherman to move fish out of cover with sheer force. Additionally, braided lines offer a significantly longer shelf life when compared to monofilament or fluorocarbon lines, and do not hold any spool memory. As braided lines are significantly stronger than other line types, the option of choosing a much thinner line diameter while still providing enough strength is an option. Cons: The strength of braided lines is also one of its disadvantages if you snag on something it can be very difficult to break. I’ve seen rods and reels break before the line does. This strength can also place more pressure and wear and tear on the rest of your gear, as shocks and pressure is directly applied to your gear rather than the line snapping. Despite their diameter, they can be spotted in more easily in clear waters, but this is not often an issue when surf fishing. When tying braided lines it’s important to be careful and leave a small tag to prevent line slippage, specialist knots can be used which are better suited for braided lines to help avoid this issue. Our biggest concern with braided lines is the potential for knot slippage. However, if you follow the manufacturer’s guidelines and their recommended knots, then knot strength should not be an issue. Your normal favorite knot may not be the best choice for braided lines. The hallmark lack of stretch inherent in all braided lines will make sure you’re aware of every movement taking place with your lure or bait, which means you’re going to be able to react quickly and set a hook if required. 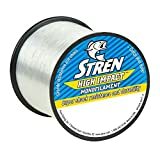 As braided lines are thinner, slicker and supple, they can achieve much greater casting distances as well as increased spool capacity. However, braids tend to be less effective at resisting abrasion when compared to monofilament or fluorocarbon. Any angler interested in surf fishing has a range of lines available to them, with each type offering a range of advantages and disadvantages. Monofilament is cheap, readily available and abrasion resistant. Fluorocarbon is near invisible when submerged, is less stretchy and resist abrasion. Braided line is fantastically strong, light, and can be cast for miles, but it doesn’t resist abrasion as well as the other two line types. Given all the pros and cons of the line types, we think a braided fishing line is the best choice for surf fishing and should be at the top of your fishing list if you want to get in some serious surf fishing.